The “inscrutability” of the East has long provided us in the West with an inexhaustible source of romance, excitement and pleasure. Our very misapprehensions and fantasies of Asia are immortalized throughout Western Civ., from the paintings of Whistler to Kung Fu. We seem specifically to enjoy the mystery, the not-understanding. I am a huge fan of Orientalism in all its many forms, and love to visit the Chinatown or Little Tokyo in any Western city. The loveliest building in all the world to me is the Royal Pavilion at Brighton, that outrageous Regency confection full of dragons and fake bamboo. There is something irresistibly naive and beautiful about these fantasy views of the East. Their very wrongness, the obviousness of how wrong they are, has a strangely tender appeal. It’s our collective misunderstandings dressed up, embellished, romanticized, for dramatic enjoyment. 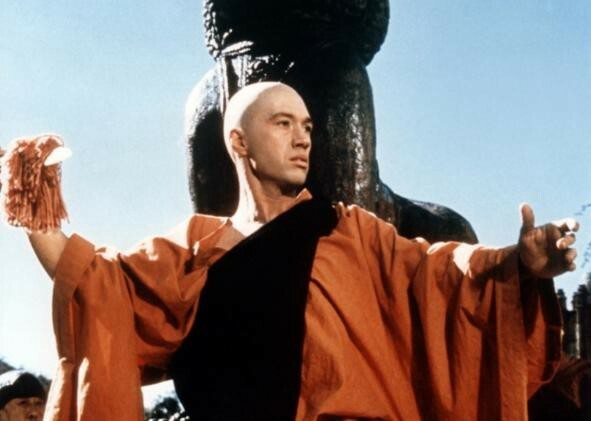 There’s a temptation to reduce all Orientalism to camp, but the spectrum of aesthetic appreciation offered by Orientalism is much wider than that. Camp asks us to enjoy things because they are so weird or funny; if our appreciation of the weirdness comes by accident to include real beauty or insight, that seems almost accidental, the by-product of a joke. But way too many Western appreciations of the East are entirely without mockery to credit that explanation as the sole one. Ernest Bramah is a little camp, but a very little; still less so, the quotations from Japanese art of Whistler or the Pre-Raphaelites. 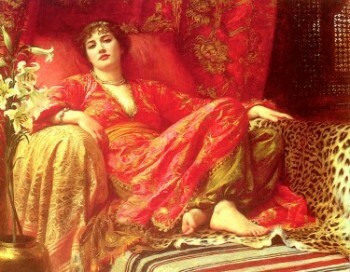 The Pre-Raphaelites in particular were as serious as a heart attack (a defect, in my view): they were very gravely damn sincere all the time; their Orientalism contained zero goofball elements. Maybe this kind of camp serves a worthy purpose of its own; it could be that the most fantastical, theatrical interplay between East and West affords us the best and freest atmosphere in which to establish a real dialogue. Our word “cosplay,” for example, is derived from the Japanese gairaigo or loan-word, kosupure, from English “costume-play.” Then we borrowed it back again. But even the most affectionate Orientalism, japonisme, chinoiserie, have their dark side, too; a racist, “othering” aspect. Pretend-Asian, the determination to reinterpret the ideas of another people according to our own aesthetics, can be seen as belittling, or narcissistic, or nationalist; childish, or primitive, or even disrespectful, hostile. Because what we define as inalterably Other, mysterious, outside, we no longer need to try to understand. The complexity of our relationship to the East is multiplied in the mirror of Eastern misunderstandings of Western culture. Americans may delight in fractured English t-shirts and exotic appropriations of Western cuisine. But there’s a very serious form of appreciation, too, of the East for the West, like Okakura Kakuzo’s The Book of Tea, by far my favorite commentary on this subject. Okakura treats both East and West with the most searing candor and also with humor and gentleness, and that makes his love of both that much more touching and real. There’s a true affinity along with the camp one, on both sides. For another example, there is nothing mock, nothing mocking and no real misunderstanding at all, in this 1983 cover of “It’s All Too Much” by a modern-day Okakura, Yukihiro Takahashi of the Yellow Magic Orchestra. Schmitz has been living in China on and off since 1996, when he first went there with the Peace Corps. He’d asked to be posted to a Spanish-speaking country, since he has a master’s in Spanish (and speaks it just gloriously, with a beautiful, rolling Andalusian accent.) “But the government sent me to China.” He spent two years in rural China at a teaching college, and then returned in 2000 as a journalist for ChinaNow.com, working under the colorful figure of journo-metalhead Kaiser Kuo, director of international communications for Baidu. Schmitz led a tour of Yunnan in 2006; he has documentary experience on Chinese ethnic minorities. He seems like a real-life “China hand” from a James Clavell book. I asked him to help me understand the fallout from his story. The distant possibility of real understanding and contact is a weapon against the paranoia surrounding the most wrongheaded ideas of Asia, such as American’s fear of the Four Tigers and the growing economic might of China, commonly stoked by demagogues employing the U!S!A! Number One! style of rhetoric. Where once this paranoia was directed at Japan and their suspiciously-hegemonistic-looking purchases of Rockefeller Center and Pebble Beach, now it is pointed straight at China and its dragon’s hoard of a trillion plus in U.S. Treasuries. What the fear-mongers invariably neglect to take into account is that the global economy is now so deeply interconnected that neither Asia nor the U.S. (nor Russia, nor India) can ever really “win.” Either all must win, or all lose. Tom Scocca’s book, Beijing Welcomes You, is a particularly sensitive and helpful examination of relations between China and the U.S. I wrote and asked Scocca about the Daisey affair, and about nationalism, exceptionalism; whether Americans care less than do the Chinese about the face we show the world. He replied: “America is generally aghast at the notion we have a face we show to the world, let alone that we might be judged by it. See the denunciations of international law. Our core belief is not that we are exceptional, really; it’s that we are normative.” Oh, boy! That is very hard to argue with. 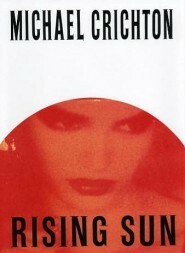 So even now, there are two kinds of fantasies of Asia among Americans: the dream-Asia of our desires, the aestheticized and romanticized Asia, and then the nightmare Asia of our prejudices and fears, the Michael Crichton-inflected fear that They’re Taking Over The World. Self-righteousness, the idea that we can know the truth, is what a good journalist will never give in to. He will give you alternatives, show you perspectives but not choose one for you. That leads to dangerous things. Daisey created a dream-Asia for us, in a proportion of about one part romance to, say, ten parts paranoia. Our misunderstandings dressed up, embellished, romanticized in a different way, for a different kind of dramatic enjoyment. Because just as we fail to understand the interconnectedness of the global economy, we never seem to get that Chinese people are just regular people, doing exactly the things we would do ourselves, were we to find ourselves in their circumstances. To exaggerate and dramatize their predicament is Orientalism of the Othering variety, substituting feel-good hand-wringing for knowledge and political engagement. So just go and like a Facebook page, and buy your new iPad in peace. Pretty thin gruel, so far as “making a difference” is concerned, as David Carr pointed out in the Times yesterday. Rob Schmitz says there is a better way to approach “making a difference,” viz., with an attempt at understanding. We love our products and we want to consume them, but some of us feel guilty about this. The guilty may sign a petition to try and help what they think is a terrible situation for the person who made their product, and that may make them feel better, but I think a still better thing to do would be to try and understand to the greatest extent possible the lives of the factory workers who make your products. There is a breadth of non-fiction work about this: Peter Hessler’s Country Driving Leslie Chang’s Factory Girls come to mind. They are easy to meet! I would invite these people to come, to stand outside the factory. There are no guns! They will want to talk: they speak English, you are a foreigner. A translator will cost you 50 or 100 USD/day. Stand outside, be a journalist for one day. Because if you haven’t talked with them, it sort of takes their humanity away. It is about you, then. “Look what we are doing to these poor people!” When they have their own thoughts! Allow them to say what their real life is like. They have great stories to tell. When I first traveled for work to Taipei and mainland China in the mid-90s, I had nothing but Orientalist fantasies in mind; the reality blew all my conjectures to pieces each time I went. Taiwan is a ravishingly gorgeous place, steamy, verdant, craggy, flowery, rich in all ways, well deserving of its first Western name, Formosa (Portuguese for “beautiful”). I was there as a product developer and designer, and I had these minders who took me around to various factories (and wonderful restaurants, including one in a mountain forest. And karaoke bars full of diaphanously-clad, giggling maidens). A fair assessment. But there was also a lot about doing business in China that I adored, compared to my experiences with U.S. manufacturers. If I had some crazy idea about how to make a photo frame or whatever and took it to a U.S. factory, they would mainly be all, “Hmm, no, well we don’t really do it that way, no, we can’t, sorry, no.” But in China they would nearly always say something like, “YES, we are going to find that kind of enamel, and we will have the sample ready for you in five days.” Five days might turn into ten, but still, they would figure it out. It was completely exhilarating to me and my colleagues, this can-do attitude. So, how did I find that workers in Chinese factories were treated? Just like in the U.S., there were places where everyone seemed to be really happy to be working, and places where they seemed less so. There was considerably less comfort than in southern California factories, but that was more to do with the infrastructure generally being not as good — roads were not as good, the water not as reliable, or as clean; things like this. They do not have OSHA in China, it’s true. But you can’t get from zero to OSHA in a single bound. Also: there is little to nothing that Americans can do about Chinese infrastructure. Anyway, I met a few hundred workers, I would guess, over the space of a couple of years, in small factories in and around Taipei and Guangzhou. They were people who lived very humbly — as in most poor countries, the older people are missing a lot of teeth — but given their straitened circumstances definitely keeping body and soul together, reasonably okay, often happy. Far better than in a lot of places I’ve been. The opportunities for advancement, like anywhere, are not great unless so many difficult, fragile variables are in place, like the chance to get an education, a stable infrastructure, access to medical care. None of which falls off a tree, and all of which requires ongoing vigilance and political commitment or it will fade away. All this by way of saying that for years I’ve been in the very trying position of defending a thing that I don’t exactly support, namely, the breakneck industrial growth of China, fueled by the insatiable appetite of Americans for cheap consumer goods. Over and over I have found myself saying to some smug armchair radical, oh, you are so against Chinese industrial practices, so these factories should all close, right? And the millions who work in these factories: they should starve, right? Because that would be more humane, apparently. 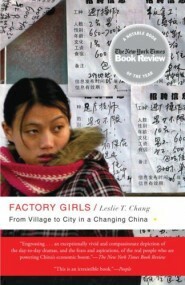 If you are from a Chinese village, a factory job can mean a huge, huge increase in your quality of life. It might easily mean the difference between food every day and no food every day. Between electricity and plumbing, and no electricity or plumbing. American money (or, perhaps one should say, American IOUs) brings a huge uptick in the quality of life for millions of disadvantaged Chinese people. And that is too immense and too complex a topic for a single stage show or newspaper article (or blog post). Those who complain about the harsh working conditions in Chinese factories appear to have forgotten that quite a lot of factory jobs in the U.S. are no picnic, either. In America, workers are being treated worse and worse every day. Stable employment, pensions and employer-paid health care are going the way of the dodo. Speaking on “This American Life”’s retraction episode last week, journalist Charles Duhigg made a strong and necessary distinction between harsh working conditions vs. life-threatening, dangerous conditions. Well, let’s not forget that we have the latter in the U.S., too, right this very minute. Every once in a while terrible working conditions are exposed in the U.S., but we can be sure they haven’t all been exposed. These stories have come to create an ongoing unease and lack of faith not only in our political and business institutions, but in ourselves and our own capacity to effect the slightest change in our own circumstances, at home or anywhere else. So it seems that the Mike Daisey debacle comes at an opportune time. We in the U.S. can no longer afford to treat China as distant or foreign; the Chinese are our partners, and our destinies are inextricably linked. We could — we should do everything in our power to make common cause with them. Only an understanding between our two nations as to how to manage the two economies in tandem, how to develop and use more sustainable forms of energy, and so on, can ensure that we all don’t just go up in flames. As Schmitz reminded me, most Americans come from immigrant families who endured all kinds of harsh conditions — dehumanizing factory work, discrimination, disease, poverty, Pinkertons — and fought, and worked, and slowly improved their own condition, and that of their nation. It’s not necessary or desirable to abandon all our fantasies of China, or for the people of other nations to abandon their Hollywood ideas of us. They provide an enlightenment of their own, an expanded and enriched reality; a slightly fractured image to delight in, and to learn from. There’s every reason to keep all our most beautiful illusions, and the grain of truth therein.